Camp Santanoni is a unique backcountry museum of what the great camps of the Adirondacks looked like in the early 1900s. 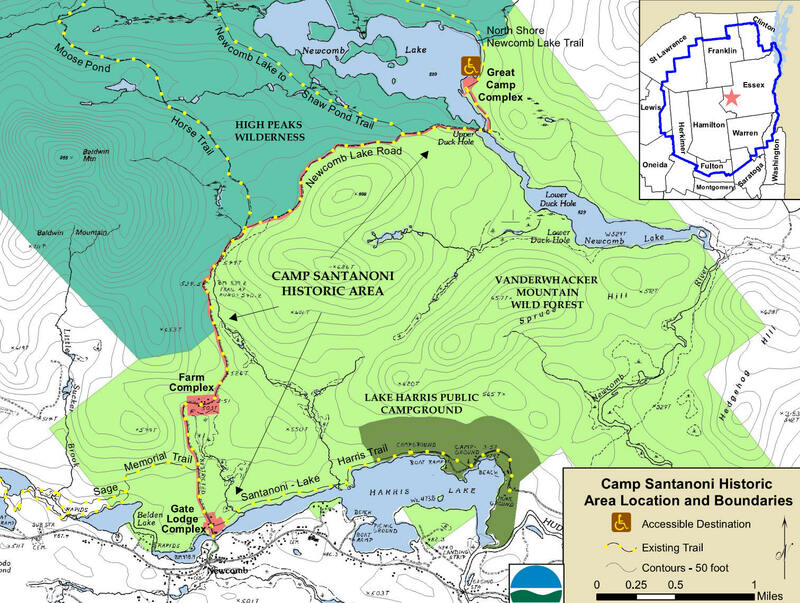 Camp Santanoni is located near Newcomb in the Central Adirondacks off NY 28N. A long 4.7 mile hike or bike on an old road leads to the buildings of the old great camp on beautiful Newcomb Lake. During the late 19th - early 20th century, some of the USA's most successful businessmen built summer homes in the Adirondacks. Originally intended as rustic retreats, they normally became elegant retreats from city life. The largest of these Adirondack camps ended up becoming known as Great Camps. Camp Santanoni is one of a few with a whole log construction and rustic styling in detail. It contains the finest examples of local Adirondack craftsmanship in its construction, architectural detail, finishes and decoration. Not only is it listed in the State and National Registers of Historic Places; Camp Santanoni is a National Historic Landmark as well. Camp Santanoni is the only great camp entirely in public ownership and stewardship. 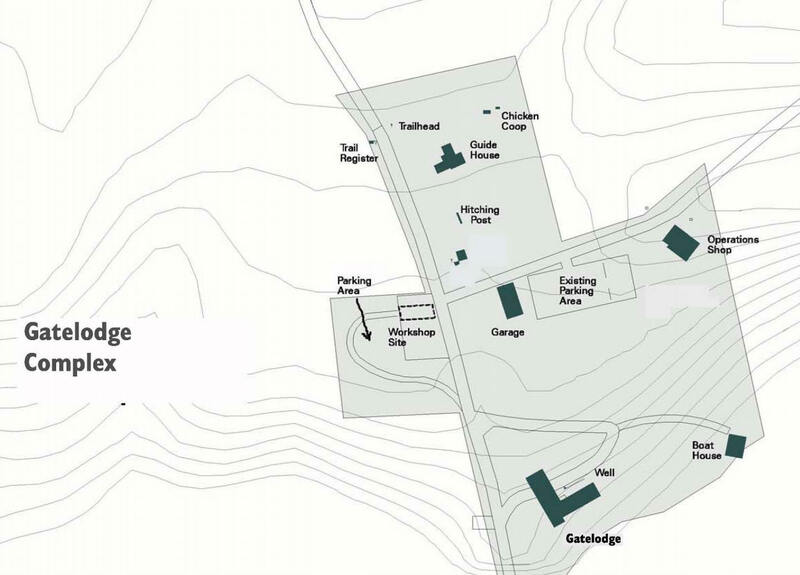 At one point the Great Camp was nearly 13,000 acres in size and included three groups of buildings, including the Gate Lodge complex located at the large parking area. 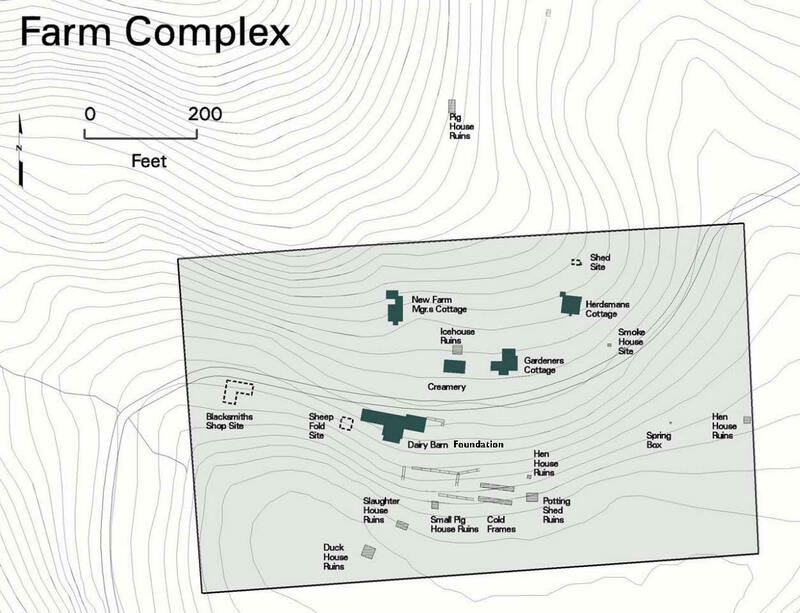 The other buildings include the farm complex, where much of the food was grown for the camp and the main great camp complex located at the shore of Newcomb Lake. There is also the 4.7 mile carriage road which is now known as Newcomb Lake Road, the main trail to reach the farm and main complex. There are two large parking areas for this overly popular destination in the Central Adirondacks. There is a visitor center in the Gate Lodge, which is open during the summer. This is a popular hiking, biking destination in the spring, summer and fall, During the winter you'll find cross country skiers on the trail to the Great Camp complex. The narrow road is easy for the most part, however it is a long one way trip of 4.7 miles. From the Gate Lodge parking area, pass by the wooden gate near the kiosk and trail register to begin your trip. Soon a side trail on your left is reached. This is the connector trail to the Sage Memorial Trail that travels to the Adirondack Park Visitor Interpretive Center. The AIC is run by SUNY-ESF, who also built and maintain the trail to the fire tower on Goodnow Mountain. The center has a complete hiking trail system worth exploring for those looking for some day hiking in this area. The entrance to the AIC is located one mile west of the entrance to Santanoni Preserve on NY 28N. After a curve the Newcomb Lake Road Trail reaches the Farm Complex. You'll find some of the buildings and remains of other buildings in this area on both sides of the road. At 2.2 miles reach the junction of the Moose Pond Horse Trail that veers off to the left. It is 4.5 miles to Moose Pond in the High Peaks Wilderness from this point along the trail. The main Newcomb Lake Road Trail veers right at this junction. The trail will eventually begin its long descent toward the lake. At 3.9 miles reach the junction of the South Shore Newcomb Lake Trail on the left. At 4.2 miles is a picnic area on a bluff located near the lake. Soon the trail will cross the channel between Newcomb Lake and Upper Duck Hole. While on the bridge look to your right for a nice view of Upper Duck Hole. After crossing the bridge, the trail turns north toward the back of the main Great Camp Complex. You'll pass numerous side trails on the left before reaching the main complex at Camp Santanoni. These lead to primitive campsites on the shore of the lake. During the summer you'll find interpreters at the complex that'll explain each of the buildings/rooms in the complex. Sometimes the buildings are locked, however there are times they are open. There is no camping allowed at the lodge, however there are many picnic tables for a great lunch or dinner that you'll need to provide. 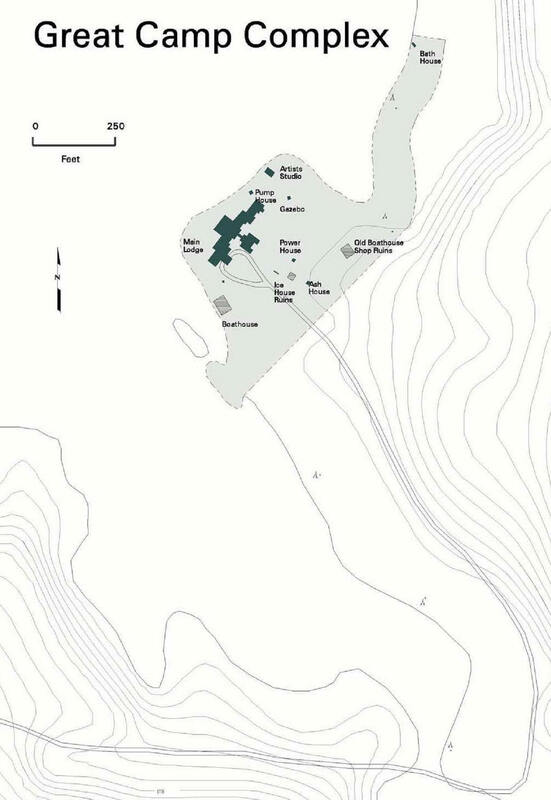 There are eight designated campsites located near the main complex. The North Shore Newcomb Lake Trail begins out of the main complex of the Great Camp. One could do a loop hike of Newcomb Lake if they wanted. This would be a 5.1 mile loop, not including the hike/bike to reach the Great Camp main complex. Do not expect to be alone at the complex, even on a weekday during the fall. This is a very popular destination in the Adirondacks. Look below for some pictures and a few maps of this hike. Directions: Take NY 28N EAST out of Long Lake toward Newcomb. 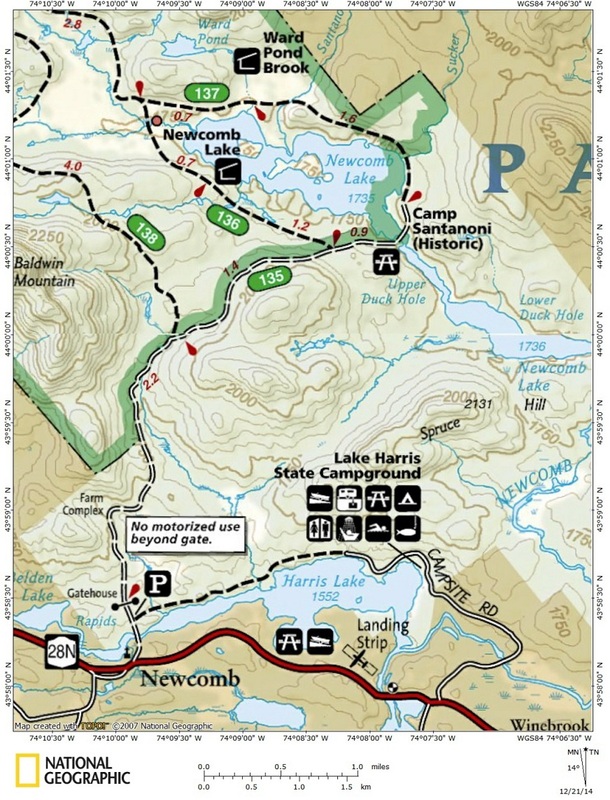 The entrance to the Santanoni Preserve is located on the left, 13.9 miles east of Long Lake. The entrance is one mile east of the Adirondack Interpretive Center and 1.9 miles west of the bridge over the Hudson River. The GPS coordinates are N43 58.140 W74 09.859 for those who have a GPS devise in their vehicle.